This sentence reflects the title of one of Ellen White’s best-known books, Steps to Christ. In reality, however, there are no steps to Christ or of salvation. Being saved is not a process through which we proceed. Rather, it is an act of God in which He sovereignly reveals Himself to our sin-dead spirits and convicts us of our sin. When we clearly see our sin and the inevitable fact that we will spend an eternity apart from God, suffering in isolation from Him, we trust His death on the cross for our sin, and we are forgiven, justified, saved, and sanctified all at once. Sunday’s lesson attempt to explain how we recognize our need, but it falls short because it fails to establish that we are not just “sinful” bue spiritually dead. We are born dead, citizens of the domain of darkness (Eph. 2:1-3; Col. 1:1), and we are helpless to see the truth about ourselves without submitting to the truth in Scripture and allowing His Spirit to drive home our own guilt. John 16:8 states that the Holy Spirit convicts the world of sin, righteousness, and judgment. We do not open our eyes one day and see our sin because we diced to see. We only see by the Holy Spirit’s conviction of us. Monday’s lesson explains that repentance has to follow our awareness of our sin and need, but it states that we are only brought to repentance by dwelling on God’s love. Only God’s love, the author states, can thaw our icy hearts and bring repentance. While it is true that our repentance is an evidence of God’s love, the method of the lesson is not how repentance is accomplished. 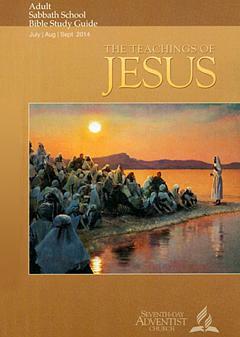 Jesus taught God’s truth and said that He Himself IS Truth. We only come to repentance when we realize that God’s love and mercy are the flip sides of His justice and wrath. In fact, His mercy and grace would have no power if He weren’t also just and wrathful against sin. And He, when He comes, will convict the world concerning sin and righteousness and judgment; concerning sin, because they have not believed in Me. In other words, on this side of the cross, the conviction of sin that leads to repentance is not merely a mental recognition that we have committed indecent or unlawful acts. Rather, it is the realization that we have not believed in the Lord Jesus. Lawful acts are only moral behavior. Repentance and a contrite heart, however, flow from the conviction that one is not trusting Jesus and His sacrifice. Unless we realize we have no hope in the universe apart from the gift of Jesus’ blood shed to pay for our personal sin, our guilt will not result in repentance. Repentance, therefore, is only the product of the Holy Spirit convicting us that we have to trust Jesus and His shed blood. We have to embrace the bloody cross or die an eternal death apart from God. Tuesday’s lesson explains that believing in Jesus “means knowing Him, understanding who He is, and receiving Him personally.” How does someone do those things? This lesson fails to explain the necessity of submitting to Scripture and giving up one’s rights to think oneself innocent or balanced or obedient. Belief involves recognizing one’s spiritual death and sin and realizing Christ is righteous—ascended to the Father because He was the acceptable sacrifice and is no longer visible because he is being honored for His perfect obedience of death and resurrection (see John 16:9). Believing is giving up one’s grip on oneself and falling fully onto Jesus’ death and resurrection as the only solution for our death. When we believe, we are at that moment sealed by the Holy Spirit who guarantees our eternal future (Eph. 1:13-14). There are no “steps”; there is only trust. Wednesday covers the parable of the wedding guest who needed a garment, so the king supplied the garments to each guest. the lesson correctly identifies the wedding garment as Christ’s righteousness, but it incorrectly explains that miracle. It quotes Ellen White saying, “The Lord also provides the garment of Christ’s righteousness for His church, so that she may ‘be arrayed in fine linen, clean and bright’ (Rev. 198, NKJV)…This robe ‘is the righteousness of Christ, His own unblemished character, that through faith is imparted to all who receive Him as their personal Savior” (COL, p. 310). This robe of righteousness, however, is not the “sanctification” nor the “making up the difference” that Adventism teaches. Instead, when we repent and trust Jesus, He justifies us freely at that moment (Rom. 3:23-26). Justification is more than a “not guilty” declaration. It is, rather, a legal pronouncement that God makes that we are MORE than innocent; we have “credit” in our account. God credits us with the Lord Jesus’ own personal righteousness. He not only removes our spiritual death by transferring us out of the domain of darkness, but He also hides us in Christ and sees the Lord Jesus when He looks at us. We are credited with the Lord’s own righteousness, not merely with His “power” to help us be good…a “power” referred to as Christ’s righteousness within Adventism. The biblical garment is permanent, a credit to our account when we believe that never goes away, even when we sin. God always looks at us and sees Jesus when we are born again. First, Christ’s righteousness is not something we claim for ourselves. It is what God gives us as His provision for us when we are born again and He adopts us. We ARE counted righteous, justified before God. Second, following Jesus is a natural response to Him. When we are born again and made alive, citizens of His Son’s kingdom, we have new impulses and desires and power. Following Jesus is our new natural way of life. The lesson’s discussion of following Jesus, believing, and getting caught up in doctrines and “forms of faith” reflects the fact that Adventism does not understand the new birth. A born again Christian is different, completely new. He will eagerly seek and desire God’s word, and there he will discover God’s will for him. He will learn God’s wisdom for living and for evaluating all things. He will become equipped to discern good from evil and will understand how to do the next right thing. Following Jesus is not a set of plans and decisions and activities. Rather, it is submitting to His word and His will and surrendering to Him the things we think we want, trusting what He gives and takes away. The Lord Jesus died to pay for the sin of the world. He had to die a human death because humans sinned, but He had to be God the Son in order to take the infinite suffering of the sin of humanity onto Himself and to bear the wrath of God meant for fallen humanity. His separation from the Father as a man who bore sin was beyond anything we can imagine, but this death that included both physical scourging and the most intense suffering and also the spiritual separation from the Father—a singularity for Him. Never before had He experienced distance from His Father. The experience of being saved is not steps. It is a complete event, a God-performed miracle that reveals to us the truth about ourselves, drives us to repentance, and forgives us and transfers us out of the domain of darkness which causes us to pass from death to life. Now there is no condemnation for those who are in Christ Jesus! (Rom. 8:1). Copyright 2014 BibleStudiesForAdventists.com. All rights reserved. Revised July 28, 2014. This website is published by Life Assurance Ministries, Camp Verde, Arizona, USA, the publisher of Proclamation! Magazine. Contact email: BibleStudiesForAdventists@gmail.com.